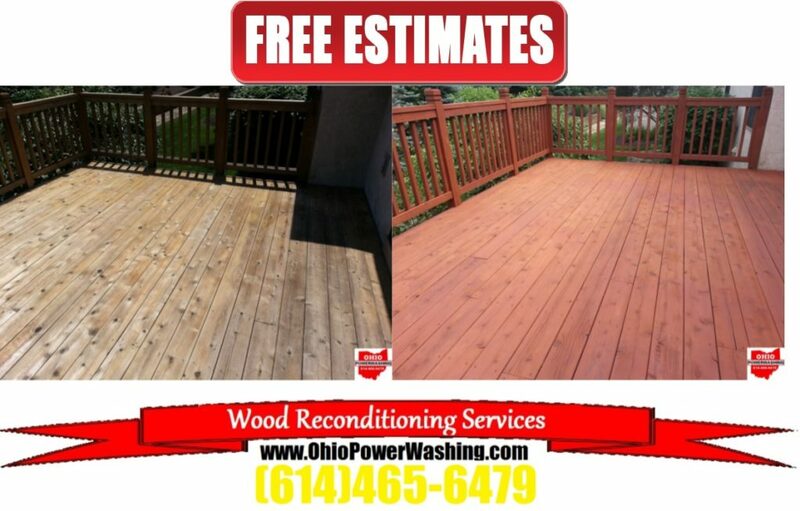 Central Ohio’s Wood Reconditioning Experts! Ohio Power Washing has taken Deck Restoration to a whole new level. Our clientele is willing to go to extremes to have their existing decks restored to its original like new look. Having a “Certified Wood Restoration Specialist” on site. All materials are Earth Friendly, environmentally safe & biodegradable. Experts in working with a wide spectrum of woods including Eastern Redwood Cedar, Pressure Treated Pine, Ipé Brazilian hardwood, Teak, Mahogany and more. At Ohio Power Washing we have been using the same Earth-friendly chemicals since 2003. We use only the best materials for all different types of wood. Same goes for the pressure washing machines. There is a BIG misconception about using chemicals on the wood and I’m here to set the record straight. Most other companies choose not to spend the money on chemicals and quality materials because they are costly. Then they end up using more pressure ruining the wood fibers and raising the grain. Because of this, you will never walk barefoot on your deck, again. We restore decks like this ALL the time. Other companies are keeping me in business by simply doing a project they’re not experts in. Handymen and painters are literally keeping us in business by doing such things. We have used professional grade wood stripper for over 10 years and it is still the best way to strip a deck. The chemical burns off the old sealer(s), in a liquid form, so we can use less pressure when removing the old sealer(s). Once the deck is stripped of the old sealer(s), we follow up by hammering all the nails back into place. Upon the completion of those steps, I’ll then neutralizing the wood and bring the pH back to normal, using “Oxalic Acid”. If the deck is not done in this order, you will not get the results we deliver, which are stunning. My portfolio and testimonials will prove my point.